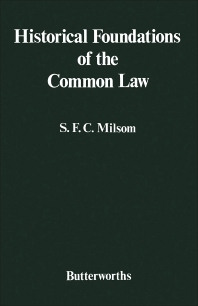 Historical Foundations of the Common Law provides a general overview of the development of the common law. The book is comprised of 14 chapters that are organized into four parts. The first part deals with the institutional background and covers the centralization of justice; the institutions of the common law; and the rise of equity. The second part deals with land properties, while the third part talks about legal obligations. The last part details criminal administration and law. The text will be of great use to individuals who have an interest in the development of the common law.